CSUB's Justin McCall tries to put up a shot over a New Mexico State defender during a Jan. 13 game at Icardo Center. Rickey Holden goes up for a layin against Utah Valley during last year's WAC Tournament at the Orleans Arena in Las Vegas. Utah Valley guard Conner Toolson, left, and CSUB guard Rickey Holden battle for a loose ball during last year's WAC Tournament quarterfinal game in Las Vegas. 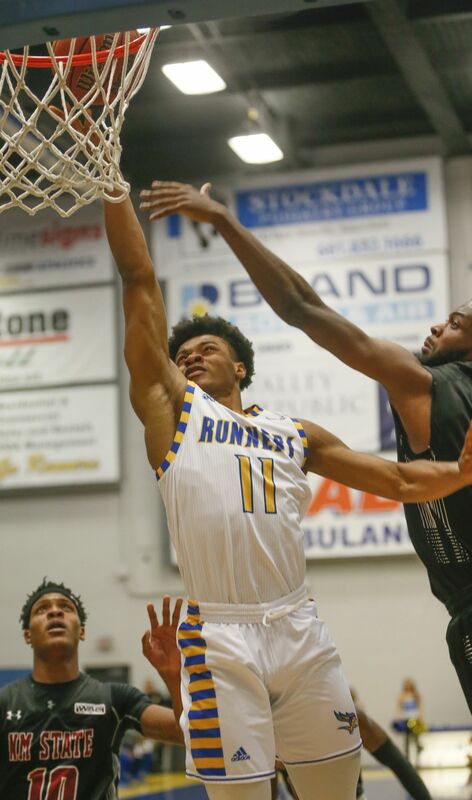 Cal State Bakersfield starts Western Athletic Conference play on Thursday, hosting Seattle at 7 p.m. in the Icardo Center. After two straight seasons with either a conference regular season or tournament title, the Roadrunners took a step back last year, finishing as the No. 7 seed and losing in the first round of the WAC Tournament. They look to return to the top this year. Stat to know: CBU’s 82.4 points per game was the highest team average of any WAC school during non-conference play. Analysis: Sure the Lancers won’t be eligible for the conference tournament, but they might be able to shake up the bottom half of the league a little bit during the regular season. The offense is potent and likes to heave 3-pointers. Acquaah, a Bakersfield native who played high school basketball in Southern California, leads the attack. Stat to know: CSUB’s 23.8 personal fouls per game is last in the conference and 348th (out of 351) in the nation. The Roadrunners’ defensive free throw rate (free throw attempts per field goal attempts allowed) of 57.2 in Division I games is second-worst in the country, according to Kenpom. Analysis: On the one hand, the Roadrunners had a five-game winning streak and almost beat TCU. On the other hand, CSUB was in a single-digit game late against an NAIA team and almost blew a 19-point lead at Portland State. Joiner can take over a game at anytime, but he and the rest of the team need to be more consistent. Stat to know: The Cougars rank last in the WAC in several statistical categories, including scoring margin, scoring offense and defense, field goal percentage defense and turnover margin. Analysis: As has become usual, Chicago State is at the very bottom of the league standings. The Cougars have three wins, but just one was over another Division I school (Eastern Illinois). Chicago State’s defense and offense are statistically among the worst in the country. Lance Irvin has a lot of work to do in his first season as head coach. Stat to know: Grand Canyon is second in the WAC with 11.8 turnovers, 18.4 personal fouls and 14.1 assists per game. Analysis: The Lopes are barely above .500 but played a tough non-conference schedule, which included games against Nevada, Texas, and Seton Hall. Lever might be the best player in the conference so GCU should be in the mix as one of the top teams in the WAC. Stat to know: Junior guard Rob Whitfield leads the WAC with 3.13 3-pointers made per game and a 44.8 3-point shooting percentage. Analysis: UMKC will go as far as Bishop and Whitfield can take it. Those two lead the offense and can score with the best of them in the WAC. The defense, though, has shown a penchant for being rather porous. Stat to know: The Aggies’ rebounding margin of 8.6 ranks 15th in the country. It’s one of several areas where New Mexico State leads the WAC. Analysis: It’s NMSU’s conference to lose. Take all the talent we really knew the Aggies had before the season started and then add Aurrecoechea, who despite only starting seven games has exploded onto the scene. It’s no wonder they almost upset Kansas. New Mexico State will be hard to beat as it goes for its seventh WAC Tournament title in eight seasons. Stat to know: Seattle holds its opponents to 38.7 percent shooting per game (best in the WAC and 27th in the nation) and scores 13.4 points more than its opponents on average (tops in the WAC and 45th in the country). Analysis: The Redhawks have plenty of talent and head coach Jim Hayford has done a great job despite being in the position for just his second season. Matej Kavas and Morgan Means headline the roster. Look out for Seattle to be one of four teams in the top tier of the conference. Stat to know: UTRGV shoots just 38.5 percent from the field and 26.4 percent from 3-point range, both worst in the conference and bottom 10 in Division I. Analysis: UTRGV’s offense misses last year's leading scorer Nick Dixon a lot, so the defense will have to win it games. The Vaqueros are certainly capable, however, forcing 17.93 turnovers (12th in Division I) and grabbing 9.7 steals (10th in D-I) per game. Stat to know: The Wolverines make 48.4 percent of their shots, which is best in the conference. Analysis: UVU’s non-conference losses came on the road against BYU, Saint Mary’s, Utah State and Arizona — all strong teams. The Wolverines wrapped up non-conference play with a big victory at Fresno State. They pass the ball around, get defensive rebounds and are efficient shooting. That means trouble for the rest of the WAC.